The risks associated with transplanting HIV-positive kidneys into HIV-positive recipients have not been well studied. Since 2008, 43 kidneys from 25 HIV-positive deceased donors have been transplanted into patients who are HIV positive in Cape Town, South Africa. Among the donors, 19 (76%) died secondary to trauma. The average age for donors was 34 (interquartile range, 19–52) years old. In some donors, only one kidney was used because of a limited number of suitable recipients on the waiting list. Only two donors had been previously exposed to antiretroviral triple therapy. In 23 of the deceased organ donors, the HIV status was not known before the time of death. Initial concerns about transplanting HIV-positive allografts into HIV-positive recipients in this clinic revolved around the possibility of HIV superinfection. However, all recipients remained virally suppressed several years after the transplant. Only one recipient experienced an increased viral load after the transplant, which was related to a period of noncompliance on her medication. After counseling and improved compliance, the viral load decreased and became suppressed again. Herein, we discuss the findings of this study and review the literature available on this crucial topic. The country did 234 kidney transplants in 2016, of which 118 were from living donors. The country has about 3500 people on dialysis, although this number is an estimate, because not all patients on dialysis are reported. At Groote Schuur Hospital, all patients who present with ESRF are assessed and discussed at a clinical meeting including medical, nursing, and social work experts. At any one time, Groote Schuur Hospital can only accommodate 170 patients on hemodialysis and 30 patients on peritoneal dialysis. As a result of this constraint, patients who do not meet very specific health and social criteria will be sent home without any RRT. To access dialysis at Groote Schuur Hospital, the patient must be declared fit and suitable for a transplant. In theory, the dialysis program serves to provide a bridge to transplantation rather than a chronic treatment modality to patients with ESRF. For this reason, access to RRT at Groote Schuur Hospital remains extremely competitive for both patients who are HIV positive and patients who are HIV negative. Patients who have the means to pay for dialysis privately or contribute to medical insurance have the option to access dialysis. However, currently, 85% of the South African population rely on the state sector for health care. It is also true that the majority of patients who are HIV positive do not have access to private medical insurance. Therefore, kidney transplantation from HIV-positive deceased donors had been a life-saving treatment option for 43 patients who are HIV positive since 2008. In 2008, when the HIV positive to positive study was started in Cape Town, the concerns in the South African medical community were, first, that patients who are HIV positive will take up scarce resources and second, that they will be susceptible to severe opportunistic infections while on immunosuppression. Furthermore, it was feared that patients who are HIV positive would get HIV disease progression on immunosuppression.2 With these concerns and the strict RRT criteria in general, patients who are HIV positive did not qualify for dialysis or transplantation at Groote Schuur Hospital in 2008. The first results from the United States multicenter study showed that there was no evidence of significant HIV progression and no adverse effect of HIV on the allograft function when using HIV-negative organs.8 These results were very encouraging for the South African clinical setting. Although there were several additional risks involved, using an HIV-positive donor seemed ethically acceptable in the South African context, because most patients in this setting had no other treatment options. The initial concerns about using HIV-positive kidneys were mainly about the issue of HIV superinfection (HIV-SI). By introducing a second viral strain, a new recombinant virus could form. This new virus could potentially outgrow the initial viral population and become more resistant to standard treatment options. HIV-SI occurs quite commonly with various other modes of transmission, including intravenous drug use and sexual transmission.9–11 Although potential HIV-infected organ recipients were required to be on effective antiretroviral therapy (ART) and HIV-SI was thought to occur rarely (if at all) in individuals on ART,12,13 there were several additional reasons for concern in the transplanted patient group. These were a potentially high viral dose in the transplanted organ with subsequent transmission of infected cell populations and the possibility of introduction of a second ART-resistant HIV strain from a donor as well as drug-drug interactions between ART and the immunosuppressive drugs used post-transplantation, which could influence viral behavior. Although these were probably the most concerning risks when the study was started, increased viral load or viral resistance in the recipients had simply not been an issue in the clinical setting. Deep sequencing techniques vary, but none are able to identify minor viral variants in the short timeframe between the procurement of the donor kidney and the transplant. In the literature, the outcomes and reports of patients who are HIV positive with HIV-SI are difficult to interpret, because there are a lot of methodologic differences, which often yield conflicting results.16,17 Ultradeep pyrosequencing of the virus can be done using two distinct techniques: circulating cellular population sequencing and single-cell laser capture microdissection directed sequencing. When a patient with low viral load gets exposed to a second viral strain, a superinfecting strain may be detectable for only a short period of time. Viral fitness and the ability of a viral strain to replicate effectively in a given environment may play a role in determining whether the two different strains will eventually become undetectable in standard resistance tests, whether outgrowth of a different virus from the baseline occurs, or lastly, whether a novel recombinant virus will become detectable.16 Deceased donors in South Africa had viral loads that varied between <960 and >150,000 as depicted in Table 1. Transplanting a recipient with a resistant viral strain is a major concern. South Africa has a unique situation in view of the fact that there are very low ART resistance rates.18–21 Surveillance for HIV-1 drug resistance had been performed on viral RNA by sequencing protease and reverse transcription genes as well as for resistance mutations in South Africa. Samples cluster phylogenetically with HIV subtype C, the predominant subtype circulating in the country. Most patients who failed second-line ART in South Africa have resistance rates <5%.22 This unique situation is an important consideration, making the scenario in South Africa for using HIV-positive donors more favorable than in many other parts of the world. Most South African deceased donors are naïve to ART. In the 25 deceased donors who were used in our study, only two reported ART: one in 2009 and one in 2013. Since 2011, plasma samples were saved in all deceased donors. Before that time, funding did not exist to save donor blood. In the saved sample data, the presence of efavirenz, tenofovir, and emtricitabine could be confirmed using high-resolution mass spectrometry in the donor from 2013. Reviewing saved donor samples in the South African study revealed two donors who tested false positive at the time of donation. Both donors had <960 copies per 1 ml on retesting the samples and had been confirmed false positive. One donor tested positive with an Abbott HIVAB HIV-1/HIV-2 (rDNA) EIA antibody assay that has a false positive rate of 0.1%. The second donor tested positive with a Procleix Ultrio HIV NAT assay manufactured by Gen-Probe, which has a false positive rate of 0.2%. One donor tested positive for HIV with an Abbott HIVAB HIV-1/HIV-2 (rDNA) EIA antibody assay but had a viral load of <960 copies per 1 ml, and the donor is, therefore, labeled an elite controller (Table 1). Median viral load for donors between August 2011 and August 2017 was 75,248 (interquartile range, 54,365–221,180). The concern is that minor viral ART resistance might occur in the transplanted kidney if a donor was exposed to ART before donation. The occurrence of preexisting ART resistance in either the circulating viral population or the memory cell–associated viral reservoir of the donor might compromise protection by ARTs in the recipient. Furthermore, HIV-SI with a resistant virus often requires the use of protease inhibitors, a common second-line HIV treatment option in South Africa, leading to interactions with immunosuppressants and potentially, increasing the risk of rejection because of interaction with calcineurin inhibitors at the cytochrome P450A enzyme binding site.23 Newer and more expensive Integrase inhibitors and CCR5 blockers that do not interfere with the cytochrome P450 enzyme binding sites are not yet freely available in South Africa, because they are reserved currently for salvage therapy or special circumstances. In the patients who received the kidneys from donors who were previously exposed to ART, recipients were switched to protease inhibitor–based regimens. Because the medical records of deceased donors are often limited, and previous studies have shown that a large number of individuals misreport ART use,25 reliably knowing whether an HIV-positive deceased donor was on ART is a problem. In addition, information on the HIV viral load and presence of any minor resistant viral variants will become more important to determine donor suitability in countries where donors have been exposed to ART. Transplant success and long-term graft outcome might be influenced by this information or lack of information, especially in countries where ART resistance rates are much higher than in South Africa. The implications of this are that certain safety measures should be in place when a brain-dead donor is selected in Europe or the United States that might not be so relevant or necessary in South Africa. Although the transplant team seldom knows the medical history of South African brain-dead donors at the time of referral, this is less likely to be a problem in the developed world. In South Africa, the HIV diagnosis is often an incidental finding, and generally, the family, who provides informed consent to the donation, does not know about the HIV diagnosis. In fact, it creates an ethical dilemma as to whether the family should be informed about the donor’s status after this is known. Currently, the transplant team at the University of Cape Town elects to only inform the person who gave consent about the HIV diagnosis if this person is also a sexual partner. The reason for this is that HIV carries a social stigma and might be an unnecessary trauma or psychologic burden to a family. However, where there is sexual partner, the transplant team feels that it is justified and ethically correct to disclose this confidential information about the brain-dead donor to the sexual partner. In the last 8 years of using HIV-positive donors, this was done on two occasions. Since September 2008, 43 kidneys from 25 brain-dead donors were transplanted at the University of Cape Town. The cause of death was trauma related in 19 of these donors (76%), and the average age of the donors was 34 (interquartile range, 22–52) years old. In this same time period, there were 15 additional consented HIV-positive organ donors who were declined by the transplant team (Table 2). Most of these donors were declined to prevent HIV-positive recipients from being exposed to additional and potentially dangerous high-risk, donor-derived opportunistic infections. Initially after the program was started, the medical community of South Africa raised several concerns. This included that the program had to be relaunched as a formal research study rather than a clinical program without a research protocol. Because there were no treatment options for patients who were HIV positive in 2008 and these patients were declined for both dialysis and transplantation, the initial thought process was to offer patients who were deemed to die an alternative treatment option. However, because of the institutional and professional response, the program was then put forward to the University of Cape Town Human Ethics Committee as a formal study, and this took several months, because the ethics committee required that dialysis should be made available to patients who are HIV positive first. The result was that two medically suitable donors could not be used while the administrative and ethical issues were resolved. In the United States, donor-derived tuberculosis is now one of the most common bacterial causes of donor-derived infection in solid organ transplant recipients.26 It is difficult to recognize latent or undiagnosed active tuberculosis in the potential organ donor. In patients who receive a solid organ, the diagnosis of donor-derived tuberculosis after transplantation is associated with significant morbidity and mortality, which can best be prevented through careful screening and targeted treatment.27 Careful thought needs to go into the selection of the donors; the diagnosis of active tuberculosis in the recipient is often challenging, because symptoms in immunocompromised patients are frequently less pronounced and atypical. Also, treatment of tuberculosis in the immunocompromised recipient is complicated by unpredictable drug interactions, drug-related organ toxicities, and development of drug resistance. 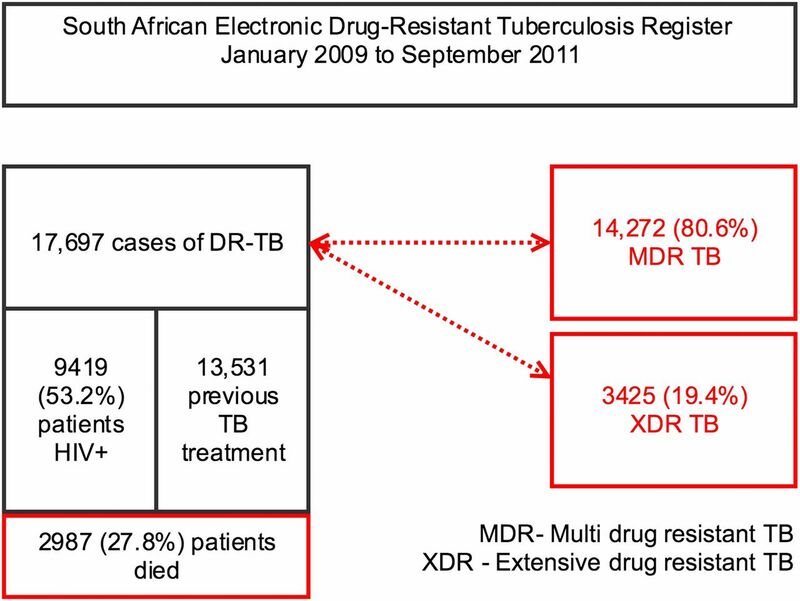 Tuberculosis rates in South Africa are high, and there are high incidences of both multidrug-resistant and extensively drug-resistant tuberculosis in the country.28 The South African electronic drug-resistant tuberculosis register reported 17,697 patients with drug-resistant tuberculosis between January 2009 and September 2011.29 Figure 1 shows that 80.6% of these patients had multidrug-resistant tuberculosis and 19.4% of patients had extensively drug-resistant tuberculosis. In this group, 27 (8%) patients died. In 53.2% of patients with drug-resistant tuberculosis, a diagnosis of HIV was present as well. For this reason, deceased donors with a history of recently diagnosed tuberculosis or those with not fully treated tuberculosis were declined as organ donors in the South African study. Between January 2009 and September 2011, 53.2% of patients with drug-resistant tuberculosis in South Africa were HIV-positive, and 27.8% of these patients died as a result. In the group of 17,697 patients with drug-resistant tuberculosis, 13,531 had an episode of tuberculosis before, and 80.6% of these patients were diagnosed with multidrug-resistant tuberculosis, and 19.4% with extensive drug-resistant tuberculosis. DR-TB, drug-resistant tuberculosis; MDR TB, multidrug-resistant tuberculosis; TB, tuberculosis; XDR TB, extensive drug-resistant tuberculosis. A recent report on immunocompromised patients with HIV infection, chronic renal failure, rheumatoid arthritis, or solid organ or stem cell transplantation and healthy control subjects evaluated different screening and diagnostic methods for tuberculosis.27 Patients were screened for tuberculosis by using a tuberculin skin test (QuantiFERON-TB-Gold in-tube test [ELISA] and T-SPOT TB test [enzyme-linked immunospot]) at 17 centers in 11 European countries. In the 768 patients screened who were HIV positive, five patients tested positive during the screening phase and were treated for active tuberculosis. An additional six patients developed tuberculosis during the follow-up period of 1.8 (interquartile range, 0.2–3.0) years. These six patients had a negative or indeterminate test result in all three tests at the time of screening. In this study, tuberculosis incidence was generally low, but it was higher in HIV-infected individuals with a positive T-SPOT TB test (3.25 patients per 100 person-years) than in those with a positive ELISA (1.31 patients per 100 person-years) or enzyme-linked immunospot result (1.78 patients per 100 person-years). In South Africa, donors are currently only screened by chest x-ray, and none of the above-mentioned tests had been performed on any of the brain-dead donors. However, where a diagnosis of tuberculosis was known or a patient was on active tuberculosis treatment, donors were declined for organ donation. A major concern is the recurrence of HIVAN in kidneys from HIV-positive donors. In the Cape Town study, two patients had lost their grafts as a direct result of recurrence of HIVAN. The histologic diagnosis of HIVAN had been made on the basis of podocytes hypertrophy and interstitial disease with lymphocytes and plasma cells (Figures 2 and 3). Recurrence of HIVAN after transplant with an HIV-positive donor: an abnormal glomeruli in a post-transplant patient who lost the graft 4 years after transplantation. Recurrence of HIVAN after transplant with an HIV-positive donor: collapsing FSGS in a patient who lost the graft 3 years and 6 months after transplantation. 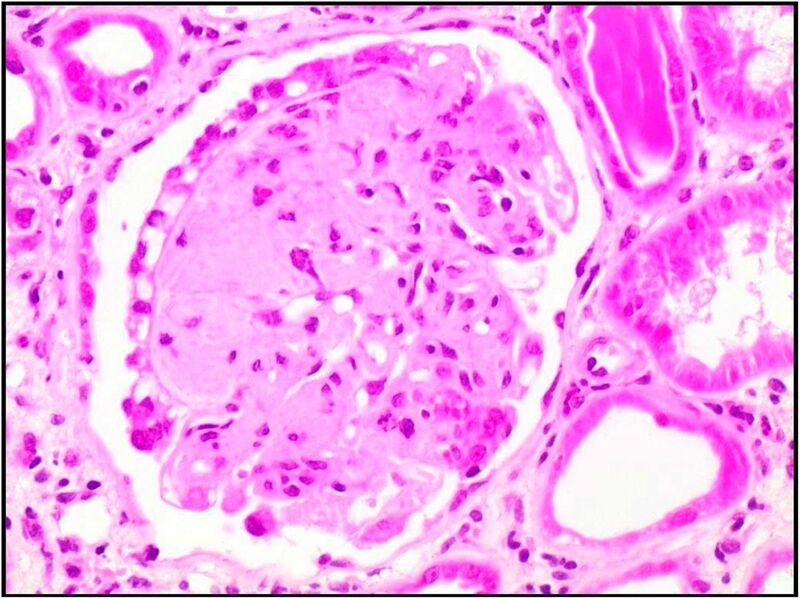 In a recent French study, the recurrence of HIVAN after using HIV-negative organs was reported to be as high as 68%.14 In Cape Town, we have six patients whose protocol biopsies report eosinophil infiltrates, fibrosis, interstitial inflammation, or tubular interstitial nephritis. Many of these patients had been treated for either rejection or drug reactions in the past. However, there is a concern that these biopsy results might also be related to a donor-derived viral reservoir and the long-term development of HIVAN. 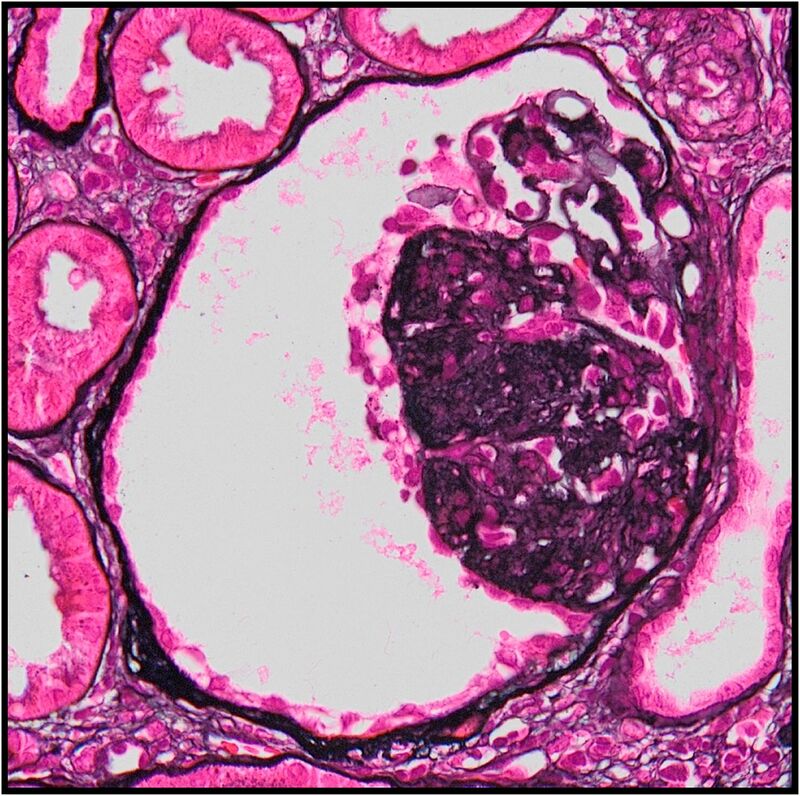 More work is currently being done to identify virus in the different compartments of the kidney. A major question remains: should donors who have minor proteinuria or early HIVAN changes in the kidney be used? In Cape Town, donor urine is first tested for protein with a urine dipstick. Negative results (0 mg/dl) and trace of protein (15–30 mg/dl) are acceptable. In all patients with 1+ (30–100 mg/dl) or more protein, urine is sent for an albumin-to-creatinine ratio. The risk is classified as acceptable if the albumin-to-creatinine ratio is <30 mg/g, but with more than moderate proteinuria (30–300 mg/g), there is a significant risk that the donor has HIVAN; this should be carefully considered, taking into account the serum creatinine and donor history. One donor in the Cape Town study showed significant microcysts and podocyte infiltration on the implant biopsy, despite having only very mild proteinuria before donation. The donor was not on treatment, with a viral load of 129,732. However, both recipients from this donor are off dialysis, and they have serum creatinine values of <1 and 3 mg/dl, respectively, and eGFRs of 49 and 51, respectively, 1 year after their transplants. It is true that using HIV-positive kidneys might not provide optimal long-term results for patients if HIVAN recurs. In the South African context, this will not be a major problem; many patients still cannot access dialysis, and waiting lists for HIV-negative donors are extremely long. In many places in the world, the waiting lists for kidneys are so long that this risk might still be acceptable. Clinicians will have to think critically about donor selection and weigh the risk of using a marginal graft for their patient versus the risk of long-term dialysis. In countries where clinicians have detailed reports on the deceased donor history, including their use of ART, this should lower the risk of HIVAN recurrence, and therefore, the practice of using HIV-positive donors should become a safe treatment option for patients who are HIV positive. We thank Mrs. Pamela Michaels (study coordinator) and Dr. Francois Botha (Department of Pathology, University of Cape Town). The authors receive funding from National Institutes of Health grant U01AI116061 (from January 15, 2015 to December 31, 2019).